Every May as the school year comes to a close, many parents’ ask their child’s lead guide what they can work on over the summer. There are many studies that show reading, math, and physical activity skills are lost over the summer months. Now we know there are a lot of workbooks that parents can purchase but past experience has shown me (with my own Montessori children) that they soon tire of these books. My suggestion is to read to your child daily. If your child is reading, have them read to you or their siblings 15 minutes a day and linear counting is great while driving in the car. There are some everyday activities that foster learning. The following suggestions encourage cooperation, self-regulation, team building, a creative imagination, and just plain old fun!!!! Enjoy these adventures with your children!! Preparing the Mother’s Day Gifts was a very sensorial activity. The children enjoyed the smells, textures, and visual harmony. This child uses fine motors skills to turn the handle on the spigot and large motors skills to carry the water can. Learning the stages of the butterfly life cycle is such a wonderful experience. 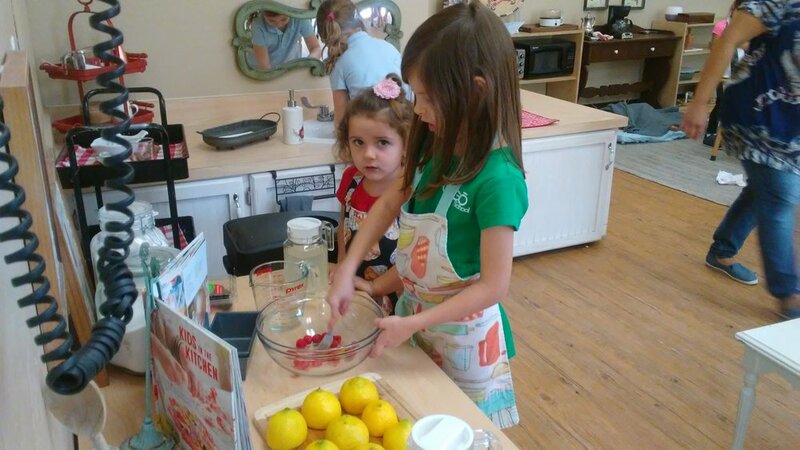 This child is exercising her leadership skills and guiding the younger child in the baking process. Making guacamole encourages chopping, peeling, mixing, and of course, tasting skills. Baking is a chance to use math skills, cooperative learning skills, and is a sensorial experience. Making lifetime friends starts early. Preparing the Mother’s Day Gifts many skills that are presented in Practical Life such as spooning, pouring, and measuring. The end product is purely a sensorial experience. Enjoying the shade and a little drum melody. Preparing the towels to use prior to lunch time. The children enjoy the smell and warmth of the towels. Working together to provide a sweet treat for the sun celebration. This child is exploring this caterpillar up close before the chrysalis stage. Caring for the fish in the classroom not only includes feeding but also replacing the water as needed. Children making crafts as they enjoy the cooler evening weather, food, and fun with their family and friends. 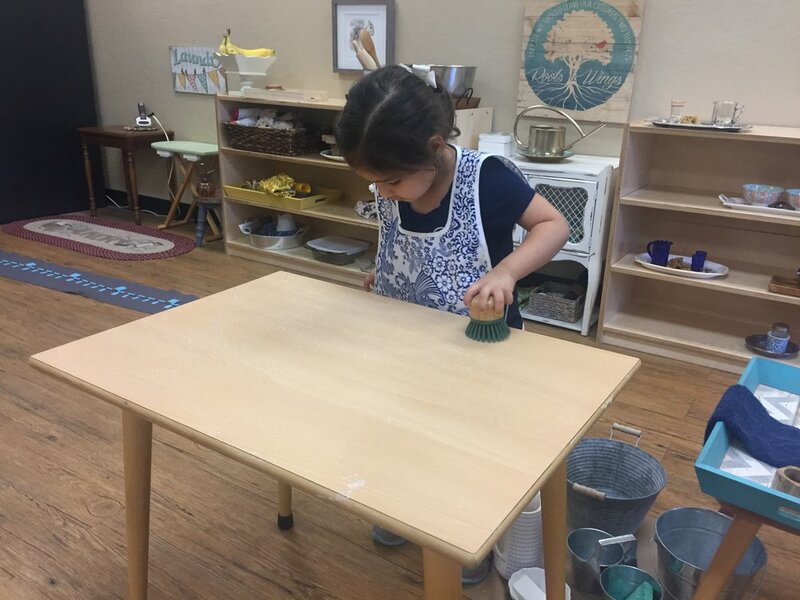 Developing a sense of order through the many sequence of steps in washing a table. Social growth is a very important part of the Children’s House Community. Care for the plants gives the children a sense of ownership in the classroom. Practicing the gift of reading and enjoying quiet time. This child found a shady quiet spot to read. The older child is guiding the younger child in the preliminary activities of spooning. Congratulations to our Fly-Up students, embarking on their journey from Children's House to Lower Elementary! Our Spring Social was a great success!!!! This was the largest group to attend. The food and smoothies were delicious, the children enjoyed playing, and all the adults had a chance to “catch up” with each other. Thank you to Marina and Lynnsie, our room parents, for all their hard work in organizing not only the social but all the community activities we do throughout the year. In the classroom, it seems as though the children are racing to do one more “big work” before the summer break. They also enjoyed preparing the Mother’s Day gifts. They loved the smell and textures of the gift. As this school year comes to an end, Miss Eugenia and I look back fondly on all the precious memories of the children. It has been such a blessing for us to observe all the emotional, social, physical, academic, and community growth over the past ten months. We wish all the best to Alexa, David, Juliet, Lyla, Santiago, and Taran as they move up to the elementary classrooms. For the children whose adventures will take them to new schools or towns, we will miss you and wish you all the best. For our returning students, we cannot wait to see all the growth you will make over the summer months and look forward to welcoming you back in August. A huge Thank You to all the parents for giving us the opportunity to guide your child, supporting the classroom in all our community activities, and the many generous gifts throughout the school year. We appreciate you in so many ways!!! Have a peaceful and safe summer break. This work leads the child through all the essential combinations of addition. Working with these boards show the child that 2 tens is twenty, 3 tens is thirty, etc. Finding the sounds in the moveable alphabet and matching them to the sandpaper letters. This activity prepares the hand for writing and gives the child an opportunity to master the his control of the instrument for writing. 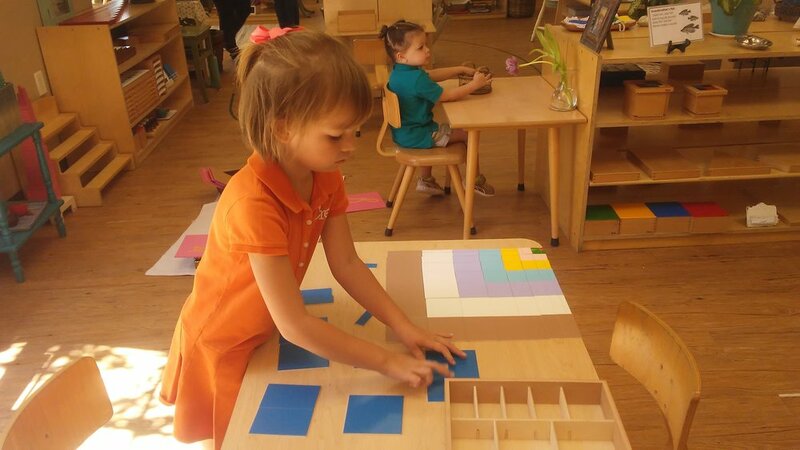 This activity encourages concentration, precision, and independence. A visual experience showing that two triangles form quadrilaterals when the equal sides are matched. Preparing the lemon towels promotes concentration, a sequence of steps, and independence. Happy memories of the Fly-up Ceremony with our future elementary children. Practicing fine motor skills and reasoning skills in a fun way. 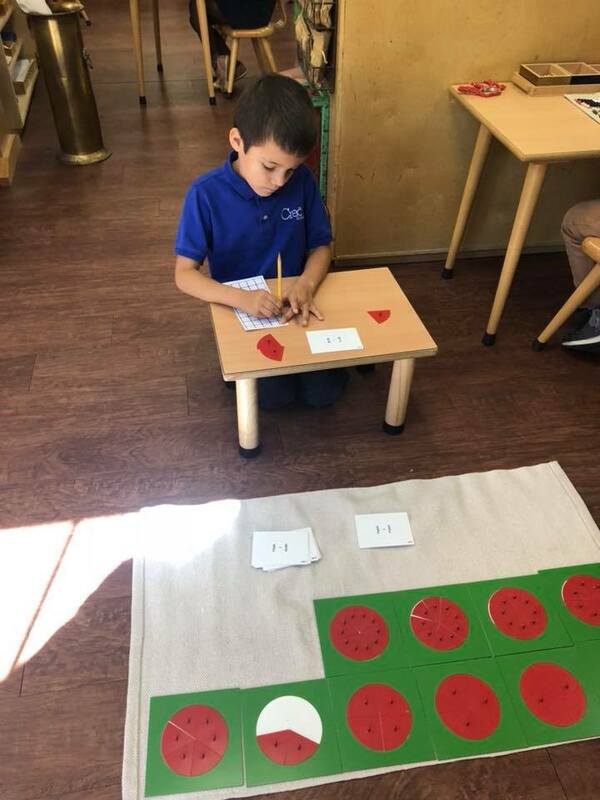 Practicing the Addition Strip Board helps in memorization of the essential combinations of addition. 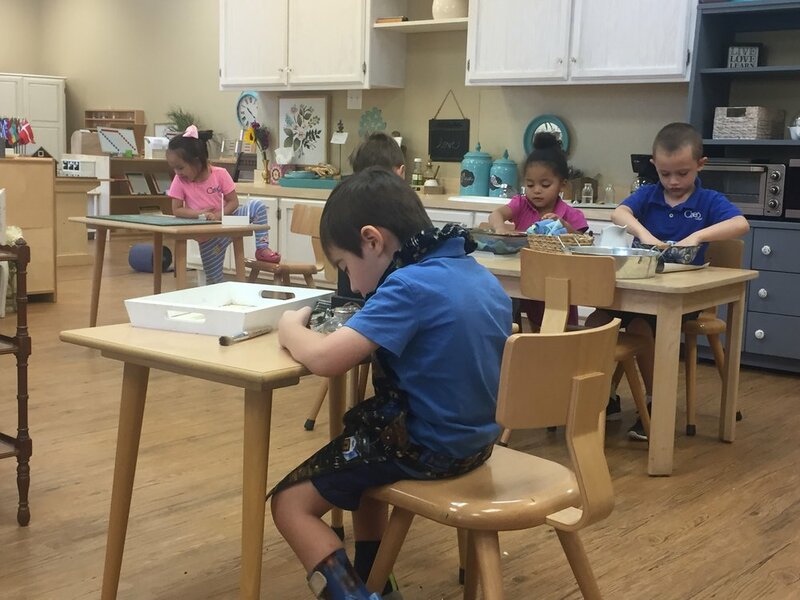 Unlocking and locking different types of locks takes concentration, fine motor skills, and reasoning skills. Building finger strength through the work with clay. This is an indirect preparation for writing skills. An activity that indirectly prepares the hand for writing. This work leads to the memorization of the essential combinations of subtraction. 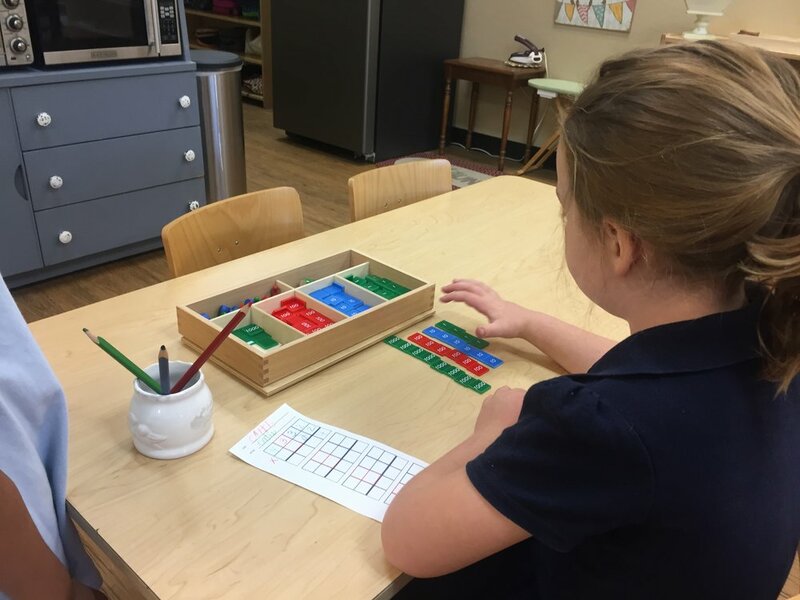 Addition Charts serve as further practice and helps the child identify any essential combinations of addition that still need to be memorized. Dear Jackrabbit Families- I am so thankful for this wonderful year and would like to thank you for your all trust and support. We feel extremely happy to see what a lovely community we have built with the help of your children and all of you! The children are so excited for their friends who are flying up to Elementary; congratulations to Elliot and CaliAnn, we are really going to miss you! We wish you all a wonderful and fun summer, we will be here waiting to hear all the fabulous stories from each of your children next August. Four boxes containing 4 sets of 10 cylinders. The child explores with them, designing and building things. She notices the contrast between different boxes. Summer summer summer time! Yay! This month we have welcomed Ms. Julia into our environment. It is so sweet to see the relationship that each one of the children is building with her through this transition. Everyone is so very excited for her to be here! This month we watched 5 caterpillars grow into it's various stages until they finally emerged as beautiful butterflies. We set them free on their merry ways to explore all that this big, beautiful world has to offer. We are also currently seeing corn and carrots growing like crazy in our garden. It should be good harvest if the heat doesn't get to them too soon. Our classroom birds have since laid 5 more eggs and we are all anxiously awaiting to see if these little guys will hatch. So much life going on in our classroom! Our classroom social had a grand turnout and fun was had by all at our Mexican....ahem Luau???? ;) Thanks you to everyone for participating, playing and being a part of our small Bobcat community. In other exciting news, we have a big group of children who will be having their last week here in the Bobcat classroom. We are sad to see these 7 members of our classroom off as they fly up to Elementary, but we wish them well in their future endeavors. Good luck!!! Lastly, I would like to thank you all for allowing me to be a part of your children's lives this past year. They will be greatly missed and I will cherish all of the endearing, funny and exceptional learning and teaching moments that we've shared to together this past school year. I may be the teacher, however they have taught me more than I had ever expected. My sincerest gratitude to each and every one of you. 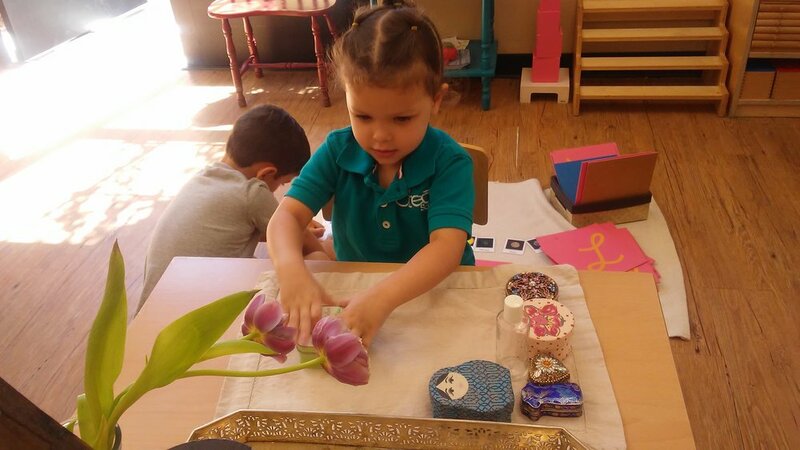 The child carefully selects the flowers she will use, decides which vase to use, uses a funnel to pour water into the vase, and uses sharp scissors to trim the flowers. The child reads a phonetic word in print and then makes it in cursive with the movable alphabet before writing it in cursive on paper. 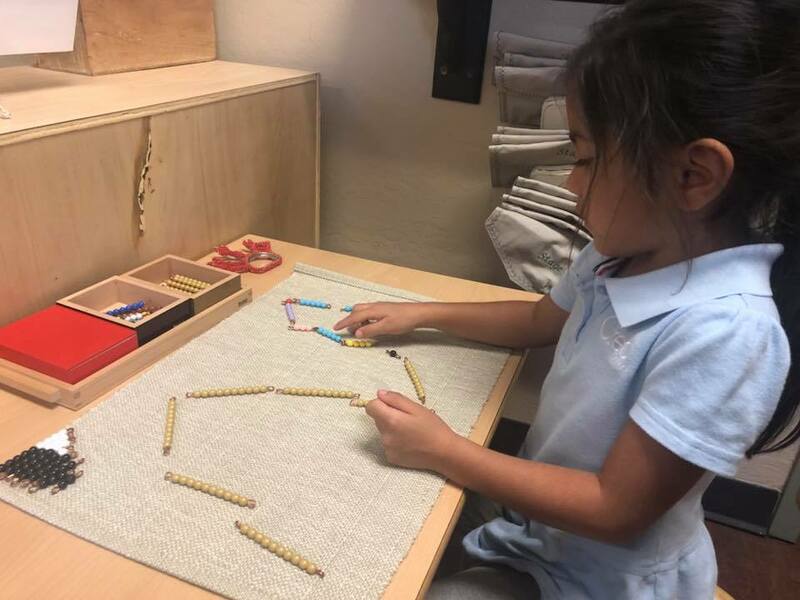 To provide the opportunity to work in a more symbolic way with division and to offer the opportunity for the child to apply memorized information for the essential combinations in division. To help the child realize that he can analyze and synthesize the graphic symbols of a written word to discover its meaning. 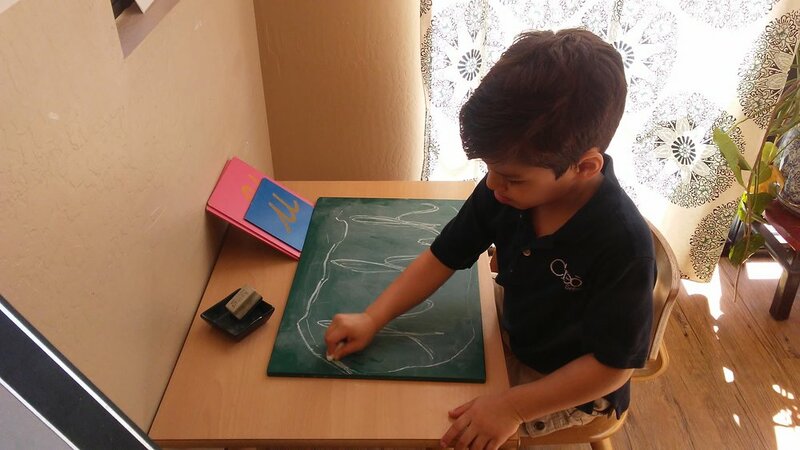 The child practices writing sounds that he’s just learned with the sandpaper letters. A box containing: 10 squares increasing in size from 1 cm2 to 10 cm2. Each square has corresponding rectangles, except for the square of one. Each square and its corresponding rectangles are of a different color, corresponding to the bead stairs in the math area. Direct preparation for writing capital letters with follow up lesson about using capital letters for proper nouns. 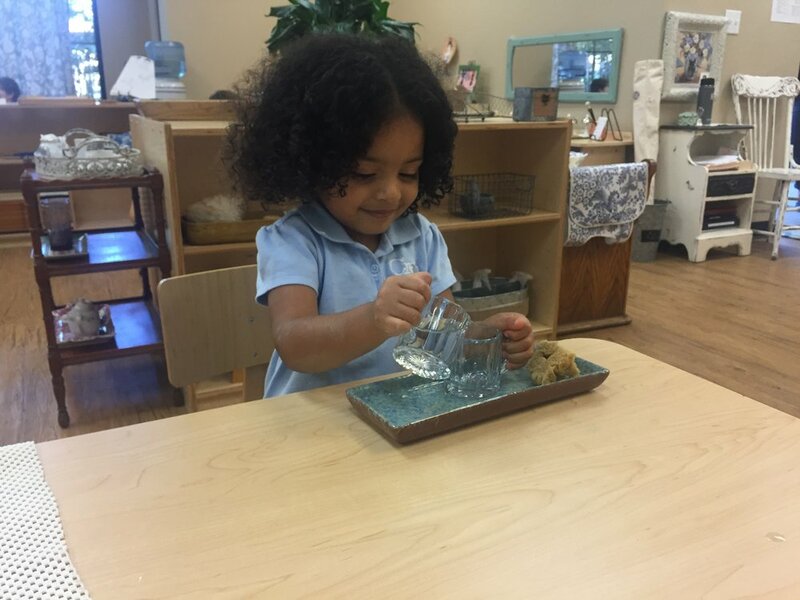 Preliminary activity to prepare the child to open containers used in other activities in the classroom while practicing hand-eye and fine motor control. The child has learned the 7 continent names and then recreates his own map. Painting is an indirect preparation for writing. Two sets of 6 identical cylinders. One set painted red and the other blue. The cylinders contain different materials such as beads, rice, sand, etc. in varying amounts so that each cylinder produces a different degree of loudness when shaken. Each set forms a gradation from loud to soft. The child begins to understand time baby the hour. Fine motor skills and art expression are what this work focuses on. The child learns the difference between carnivore, herbivore and omnivore through exploration with animal cards. Wow! We can’t believe this year is coming to a close. The amount of development we have witnessed has been paramount. This group of children has been so incredibly special and demonstrated compassion far beyond their years. In May, we had some big things happen! One of the children lost their first tooth. This sparked some really fun conversations about the growth of all living things. Our Spring Social was a great success. We cannot thank our room-parents enough for all of their effort this year. We feel so lucky! It has also been bittersweet preparing for the Fly Up ceremony; we will miss our four flyers dearly. Congratulations to Cooper, Keaton, Aden and Lily. Finally, we extend our most sincere thanks for all who contributed to the Teacher Appreciation gift. What a wonderful surprise. We are extremely grateful for your support, love and most of all, your trust with your most precious gifts, your children. The hand towels activity focuses on sequence, order and control of movement. The children explores mathematical operations with fractions. 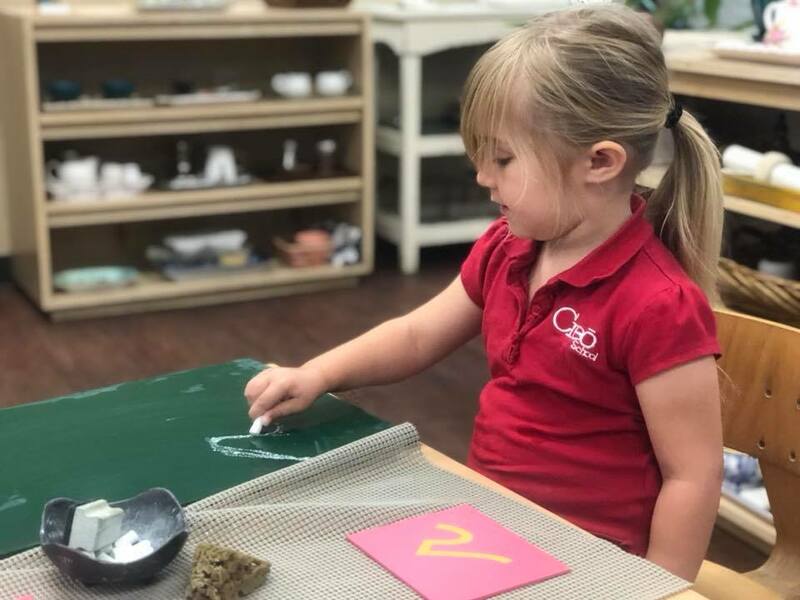 The child traces a sandpaper letter and recreates it on the chalkboard. This is a step toward handwriting. The children identify and places numbers 1-100 in order. 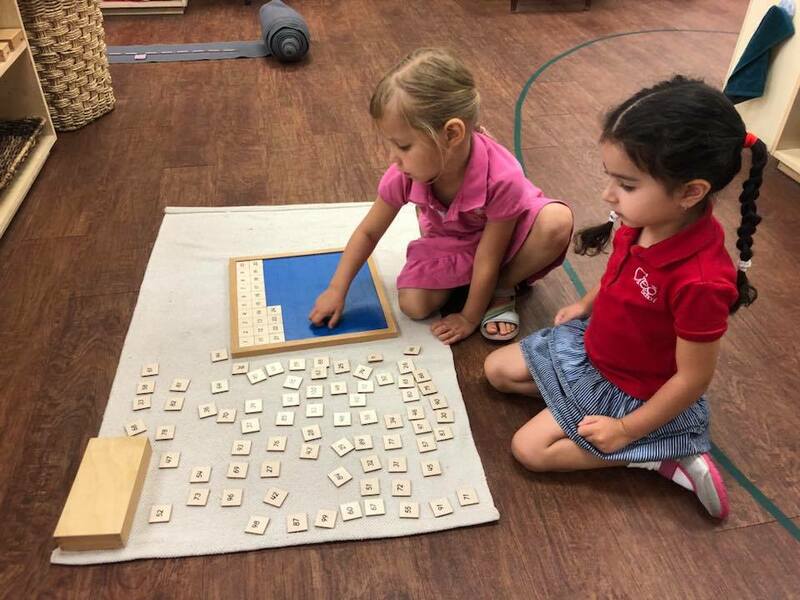 The child combines a nomenclature and moveable alphabet activity. The children explore the principles of mathematical operations. The first step toward memorization of the essential combinations for multiplication. The children play a game geared toward memorization of puzzle words. The child experiences the essential combinations for addition. The child shares his knowledge of vocabulary with a friend. The child works with a stereognostic activity. Learning that numbers can be a separate quantity, also 1:1 correspondence and number recognition. This is a test for the child and guide.